Researchers at the University of Leeds have discovered a pain-free way of tackling dental decay that reverses the damage of acid attack and re-builds teeth as new . It’s a vicious cycle, but one that can be broken, according to researchers at the University of Leeds who have developed a revolutionary new way to treat the first signs of tooth decay. Their solution is to arm dentists with a peptide-based fluid that is literally painted onto the tooth’s surface. The peptide technology is based on knowledge of how the tooth forms in the first place and stimulates regeneration of the tooth defect. 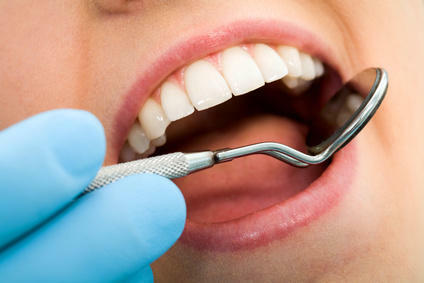 “This may sound too good to be true, but we are essentially helping acid-damaged teeth to regenerate themselves. It is a totally natural non-surgical repair process and is entirely pain-free too,” said Professor Jennifer Kirkham, from the University of Leeds Dental Institute, who has led development of the new technique. The ‘magic’ fluid was designed by researchers in the University of Leeds’ School of Chemistry, led by Dr Amalia Aggeli. It contains a peptide known as P 11-4 that — under certain conditions — will assemble together into fibres. In practice, this means that when applied to the tooth, the fluid seeps into the micro-pores caused by acid attack and then spontaneously forms a gel. This gel then provides a ‘scaffold’ or framework that attracts calcium and regenerates the tooth’s mineral from within, providing a natural and pain-free repair. The above story is reprinted from materials provided by University of Leeds.